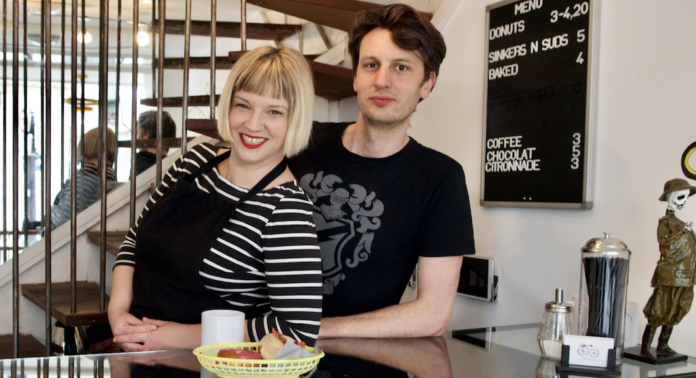 Amanda Bankert and Louis Scott at Boneshaker's doughnut counter. Credit: Dan Spigelman. Open Tuesday-Friday, 8:30am-6pm, and Saturday, 10am-7pm, or until supply runs out. Becoming the Paris doughnut whisperer wasn’t Bankert’s initial plan. She’s a pastry chef with training in classical French technique, and her Irish husband Louis Scott has nearly two decades of front-of-house experience throughout Paris. 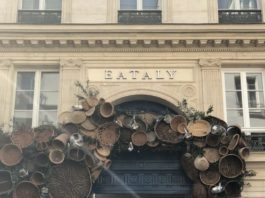 They knew one thing: they would open a place together in Paris, a city Bankert “fell in love with within two days of being here” as an exchange student from Sarah Lawrence. “We decided to do doughnuts because you just couldn’t get them here,” Bankert explains. 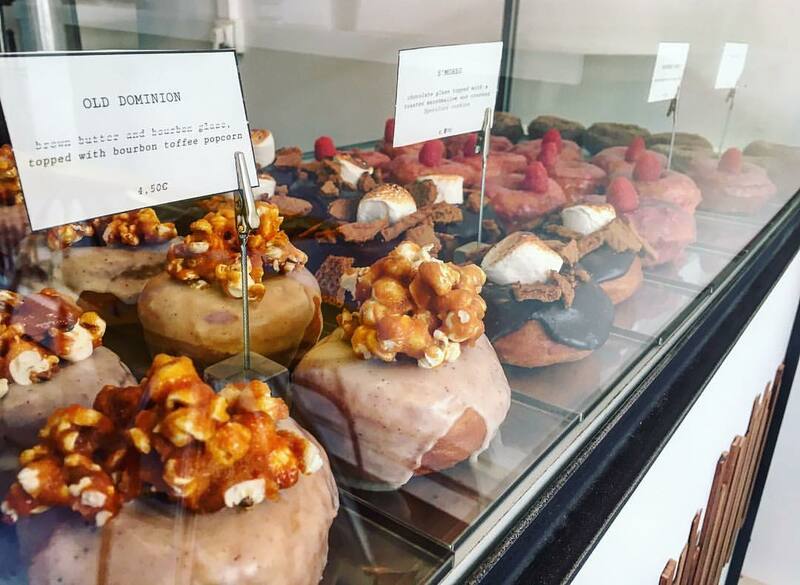 Boneshaker Doughnuts, located on chic-but-just-gritty-enough Rue d’Aboukir in the second arrondissement, opened its doors in July 2016. 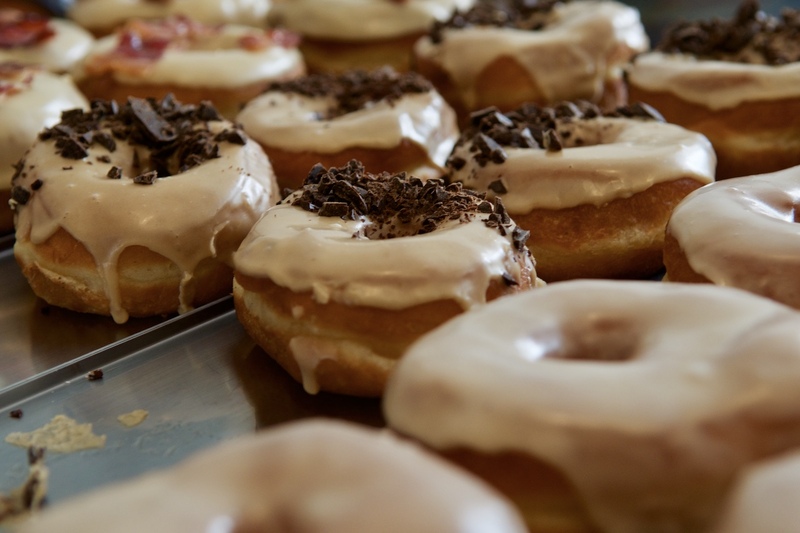 Doughnuts in the case at Boneshaker. Credit: Dan Spigelman. The fact that Parisians have, overall, welcomed an American pastry in their rotation doesn’t come as such a surprise for Bankert. 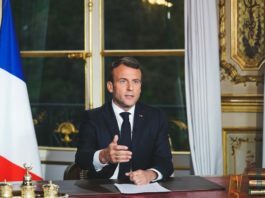 As a college student, she was amazed to find locals warm and very helpful — quite unlike everything she had heard about so-called French rudeness: “Not one person here has singled me out because I’m American,” she adds. It does appear clearly that Boneshaker’s founders – and doughnuts – have found a home in Paris. Asking Bankert to pick a favorite doughnut is like choosing a preferred child, but with a little prodding, her love for caramel beurre salé, a true French classic, comes to light.